Armed with a 545 hp, twin-turbocharged V-6, and some of the most sophisticated transmission technology on the planet, the Nissan GT-R makes short work of many other super cars in its class. Its close-shifting automatic transmission and traction control so perfectly apply its phenomenal power that a second’s hesitation on the accelerator or between gears will leave most challengers looking at nothing but its tail lights. 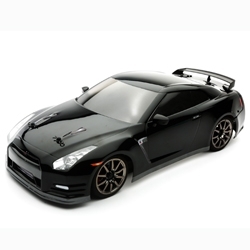 This ready-to-run recreation of the 2012 Nissan GT-R is built on the Vaterra® 4WD V100-S chassis. Its low profile tires and powerful Dynamite motor system let you drive fast and corner hard with incredible control, just like the real thing. And you’ll do so in style with attention-getting details like clear headlights, chromed exhaust tips and side-view mirrors. Rule your little corner of the asphalt jungle with this ready-to-run recreation of the awesome Nissan GT-R touring car. Its 4WD V100-S chassis, low profile tires and Dynamite® motor system let you drive fast and corner hard with incredible control, just like the real thing. And you’ll do so in style with attention-getting details like clear headlights, chromed exhaust tips and side-view mirrors. The V100-S chassis gives you a balanced, neutral handling car with a wide range of tuning options. It also features universal body mounts that are compatible with most other 1/10-scale bodies. The elegant aggression of the GT-R is present in every line and curve of the officially licensed body. Details include side view mirrors, chromed exhaust tips and clear headlights. Life on the street isn’t always dry and weather is often less than perfect. That’s why the GT-R has been equipped with a waterproof receiver, speed control and steering servo so you can run in all kinds of conditions. *For complete details on waterproof standards, please refer to the product instruction manual. The shaft-driven 4WD delivers excellent traction on paved surfaces and superb drift control when sliding across loose surfaces. The differentials are sealed against the elements and can be tuned for a variety of running conditions. The low-profile tires and 54mm wheels, along with the detailed appearance of real brakes and calipers, look as good on display as they do on the move. The rear tires also have a little more meat than the fronts for better grip and a little more attitude.